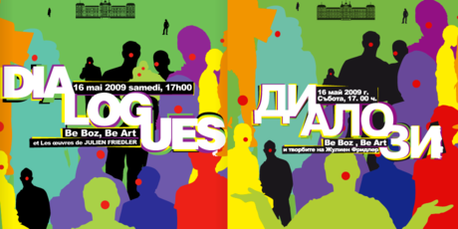 The National Gallery for Foreign Arts in Sofia (Bulgarie) presents « Dialogues » de Julien Friedler. Intended as a « conceptual and interactive », art show, « Dialogues » confronts works by Julien Friedler to the Be Art-Be Boz projects that he initiated a couple of years ago. In this presentation, personal intimate works dialogue with global collective ones, dream and reality responds to real, modernity interacts with traditions and writing with visual arts, with the intend the visitors will react and participate, since they are invited to answer the 6 questions of « Around the Boz In 80 Years ».